14,901 valuable elements of nature on the Slovenian territory have been given the status of a valuable natural feature, 8,382 of which are subterranean caves. Interventions to and activities on valuable natural features may only be executed in the absence of other spatial or technical possibilities. Valuable natural features include all natural heritage sites on the territory of the Republic of Slovenia. A valuable natural feature is defined as a rare, valuable or well-known natural phenomenon as well as any other valuable phenomenon that is part of living or non-living nature, a natural area or part of a natural area, an ecosystem, landscape or designed landscape. This includes geological phenomena, minerals and fossils and their sites, surface and subterranean Karst phenomena, subterranean caves, gorges and narrows as well as other geomorphological phenomena, glaciers and glacial forms, springs, rapids, waterfalls, lakes, bogs, brooks and rivers with banks, the seashore, plant and animal species, their exceptional specimens and habitats, ecosystems, landscape and designed landscape. The Rules on the designation and protection of valuable natural features (OG of the RS, No. 111/04, 70/06 and 58/09, hereafter "the Rules") gave 14,901 valuable elements of nature the status of valuable natural features of national or local importance. Valuable natural features of national importance comprise features that are of international or great national importance and which are under the jurisdiction of the state. The rest are of local importance and are protected by the local communities. All valuable natural features within protected areas established by the state are of national importance. Features of national importance also include all subterranean caves, which were given status of a geomorphological valuable natural feature with the amendment to the Rules in 2006. 8,382 subterranean caves are maintained separately in the Register of subterranean caves, which forms part of the Register of valuable natural features. In this Register, detailed records of all valuable natural features are maintained by the Environmental Agency of the Republic of Slovenia. Interventions to and activities on valuable natural features may only be executed in the absence of other spatial or technical possibilities. They must be executed in a manner that ensures that the valuable natural feature is not ruined and that does not alter the characteristics that make that part of nature a valuable natural feature. As a rule, current use of the valuable natural feature is preserved; however, sustainable use that does not threaten the existence of the valuable natural feature nor impede the protection thereof is also possible. The valuable natural feature and its immediate vicinity can be properly organised for public visits by stabilising the trails and panoramic spots, setting up resting places, setting fences, information and warning boards, etc. Valuable features, which according to their importance are classified into valuable features of national and local importance, can subsequently be additionally protected by the state or the local community by means of protection measures that have been defined in the Nature Preservation act (contractual protection, custody, temporary or permanent protection as well as restoration). The Register of valuable natural features, Environmental Agency of the Republic of Slovenia, 2009. 14,901 valuable elements of nature have been given the status of a valuable natural feature, of which 6,519 are valuable natural features and 8,382 are subterranean caves. All subterranean caves are of national importance, while 2,092 (32.09%) of the other valuable natural features are of national importance and 4,427 (67.91%) are of local importance. In order to ensure uniform management, all valuable natural features established by the state are of national importance, regardless of the scientific criteria. The density of valuable natural features for the entire country (20,273 km2 by taking into account planimetrically determined surface areas of the country minus sea surface areas) amounts to 0.32 per square kilometre or one valuable natural feature per 3.11 square kilometres. 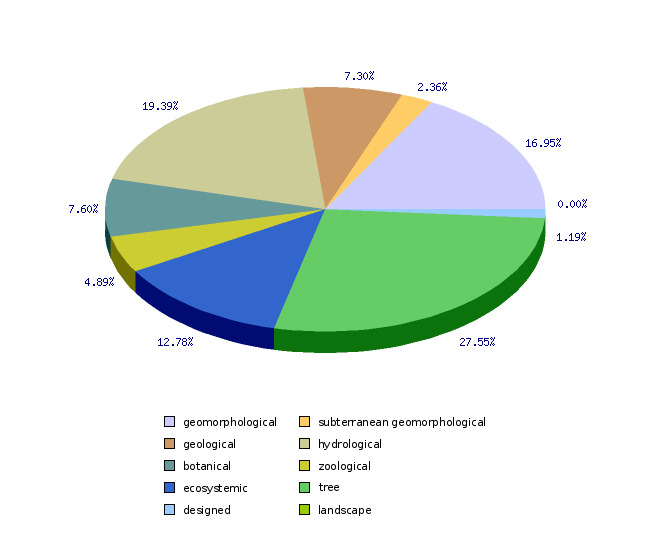 Valuable natural features include 3,688 objects (56.6%), spatially presented as points, while 2,831 (43.4%) objects contain both a point that serves as the identity-holder, as well as a polygon delineating the area of the valuable natural feature. The total surface area of all polygons amounts to 2,523.17 km2 or 12.45% of the country's territory. Polygons are predominantly small in size, as only 337 of them exceed 1 km2. In terms of the surface area, the largest geomorphological valuable natural features are the Pokljuka and Jelovica Plateaus, followed by the Nanos overthrust structure and the Karst edge. In July 2006, the Rules amending the Rules on the designation and protection of valuable natural features gave 8,382 caves the status of subterranean geomorphological valuable natural features of national importance. This means that the density of caves – valuable features (20,273 km2 by taking into account planimetrically determined surface areas of the country minus sea surface areas) - amounts to 0.413 caves per square kilometre or one cave per 2.419 square kilometres. The Rules also designate one of the three protection regimes in terms of access to each cave. According to the access regime, caves are divided into closed caves, where the natural cave environment is vulnerable to such an extent that any entrance into the cave could damage or threaten it; controlled-access caves, where the natural cave environment is vulnerable to such an extent that any unsupervised entrance into the cave could damage or threaten it; and free-access caves, where unsupervised entrances, provided the general protection regime is respected, cannot damage them. Ideally, all 190 closed and controlled-access caves would have a gate at the entrance of the cave, which, coupled with custody, would ensure actual control over the cave. 79 caves are currently equipped with gates and 22 caves are defined as tourist caves. There are also 88 caves recorded as burial places. Even though no systematically gathered data concerning the pollution of caves for all of Slovenia are at hand, it can be estimated on the basis of available data that 15-20% caves in lowland Karst areas are polluted. The Register of valuable natural features is maintained by the Nature Conservation Sector of the Environmental Agency of the Republic of Slovenia on the basis of the Article 39 of the Nature Conservation Act (NCA_OCT1, Official Gazette of the Republic of Slovenia, No. 96/04) and Article 4 of the Rules on the designation and protection of valuable natural features (Official Gazette of the Republic of Slovenia, No. 111/04). Methodology and frequency of data collection for the indicator: Data is collected upon each amendment to the Rules on the designation and protection of valuable natural features. - Advantages and disadvantages of the indicator: Official data is used as published in the Rules on the designation and protection of valuable natural features.